Belleek Lattice Work © Travel Signposts..
Belleek is a little village in County Fermanagh in Northern Ireland that not many people may know about, except perhaps those people who are keen on Belleek china. Whilst the larger part of Belleek is in County Fermanagh, a part of the village spills across the border into County Donegal. So, after our stop in Donegal, we hop across to Belleek to visit the Belleek Pottery Visitor Centre. Belleek is home to the Belleek Fine Parian china, a pearly coloured china. The company was established in 1857 and is best known for its fine lattice work ornamental pieces that are decorated with pastel-coloured flowers. 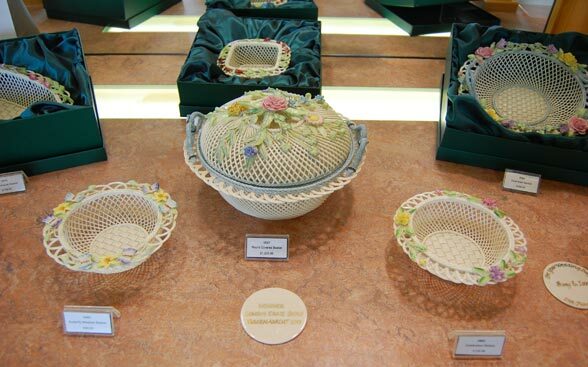 In the foyer of the Belleek Centre, visitors will see Belleek’s most prized piece of work. “The International Centre Piece” is one of the oldest and most prestigious pieces of Belleek ever made. This piece was displayed at the Paris Exhibition in the year 1900 where it was awarded its fourth gold medal. 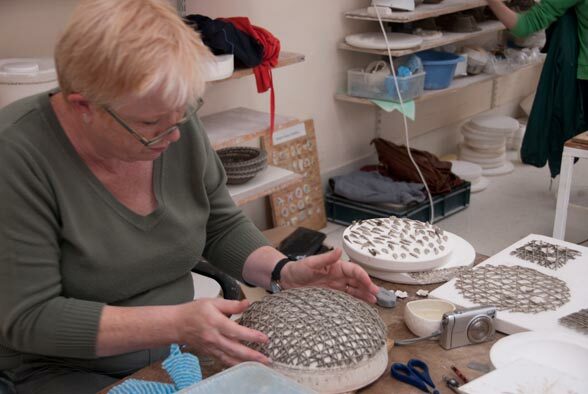 Our 30-minute guided tour of the Belleek factory starts at the mould-making area, then the casting department, the basket making and floral department, the kiln firing area and then finally to the decorating area. At each of the departments, our young Irish guide explains the processes that take place in that area. The basket making and floral department is quite interesting. As we watch the craftspeople weaving intricate strands for the basket pottery (see picture below) and then painstakingly creating little flowers, leafs and stems for them it makes one appreciate the skills and how much manual labour goes into each piece and therefore the cost of the china. All the products here are hand-made and every piece is an original piece. Except for the basket-making and floral department, you’re not allowed to take photographs on this walking tour, although it’s not obvious why photography is not allowed. If you’re a collector or are looking for some Irish gifts, there is plenty of time after the tour to gaze around in the showroom. Whilst the ornamental pieces are very pretty, for many people they are not utilitarian and neither are they easy to carry around on tour. A few people bought small pieces, like the Christmas snowman, porcelain bells, broaches, etc.